CELTIC NATIONS, How too choose? I would like to honor my ancestors but being English,Irish,Weish and Scottish I am not sure which one? I do feel more drawn to the Scottish side. If anyone else had this kind of decision to make I would like to hear how came to it. Do you have more ancestors from one than the others? If so, you may wish to take that into consideration when trying to decide. Or as you said, you feel more drawn to or have a stronger connection to a certain side. My great grandfather on my father's side was born in England, his father born in Scotland ,mother born in Ireland. 2xGreat grandfather was born in Wales ,that was something I found out last week end, great grandmother was born in Germany on my mothers side. Everything about Scotland excites me. I hear the music, the way they sound when they speak, or when I see pictures of the country side. I feel more at home there then I do here where I was born. I thank you for your point of view it was a help. Well I was born into a split heritage family as well. My fathers side English (Lethbridge) and my Mothers side Stewart(Scottish). My father really made the decision for me before I was born and before he met my mother he was a drummer with the 48th Highlanders of Canada, also played with The Toronto Scotish and The Toronto Irish Pipe Bands as well. I think this is what attrcted my mother to him. Naturally being the son of a drummer it was the first instrument I learned to play. Only when I turned sixteen did I start to learn the great highland bagpipe. Met my wife while playing with The Pipes and Drums of Lindsay(the local pipeband that me, my father and a few others started back in 1970. 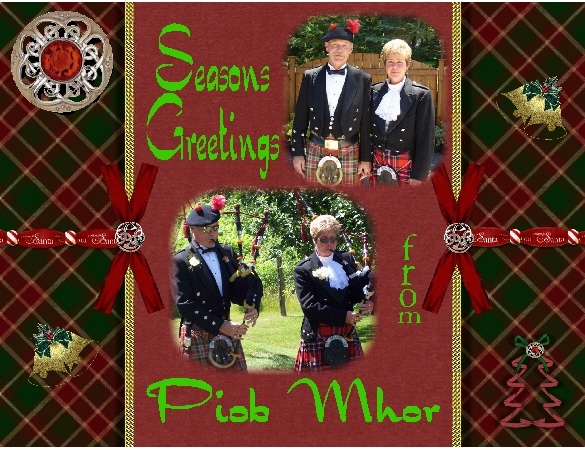 She is of full Scottish heritage and plays the pipes as well. The Scots of course insist that the pipes produce music. But the point is after all not too important. For those who love them, the pipes can evoke more vividly than any other instrument, high emotion, they can inspire valor, and tell of tragic tales of battles long ago. They can call forth merriment or sentiment. It does not matter what the sound is called, those who are deaf to its merits would not understand anyway.